The shop name has brought smiles to a lot of people's faces. Its name has brought smiles to a lot of people's faces since it opened up in town, but sadly Harrogate bargain store Ow Much? will close it doors on Beulah Street next month. 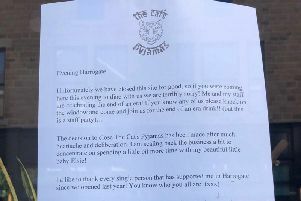 The owner of the shop, Stewart Nelson, said he's loved running the business - getting to know customers, seeing people take photos of the shop name, and even yelling 'Ow Much?!' down Beulah Street, but he said the time has come to close down due to the cost of rates. He said: "We are closing down due to expensive rates, and with the shops premises being on the side of an alleyway, I am constantly subjected to looking at rubbish that's being dumped daily. This in turn does not give a good vibe for people to come and enjoy the shop - although once inside, the shop has such a positive atmosphere - everyone's laughing and having a good time, just like you would whilst walking around a market stall. "I have loved being a part of the Harrogate retail sector, and at 25 I'm sure one day I will aim to have possibly another shop here. But for now due to the expensive rates and the rubbish, my venture has been an experience, I'd really like to thank everyone on Beulah street, especially Bass & Bligh, for helping me out from time to time due to running this large shop on my own. "I did not think when I left university that i would end up living and owning a shop in Harrogate, so I'm very grateful to everyone who has come into the shop, taken photos of it or even yelled down Beulah street "Ow Much?" Ow Much's last day will be April 27, depending on stock levels. Stewart will be returning to his other store in Otley, The 20p shop.